﻿ Raúl: "I hope Cristiano Ronaldo stays at Real Madrid"
06.05.2013 » Raúl: "I hope Cristiano Ronaldo stays at Real Madrid"
Raúl has voiced his opinion on the specualtion towards Cristiano Ronaldo's future and stated that he hopes the Portuguese stays at Real Madrid next season. Nevertheless, the Spanish legend confessed not to know much more about what happens inside Real Madrid locker rooms than what already comes out to the public these days. The former Real Madrid player Raúl Gonzalez, has granted an interview to the French website "Le10Sport" and not only he had reserved some kind words towards Cristiano Ronaldo, as he also expressed his concern about the 27-year old forward future. Raúl is well aware of CR7's importance on the team and surely knows that any scenario during the transfer season where Real Madrid doesn't manage to hold Cristiano Ronaldo can easily turn out to be catastrophic. The Portuguese star arrived to the Spanish capital in 2009, in a world-record transfer fee of 80 million pounds paid to Manchester United. Few players in Real Madrid history have earned the right to be respected and idolized as Raúl Gonzalez Blanco. Now aged 35 years, the eternal Merengues captain is playing in Qatar, in Al Sadd SC. He left Madrid back in 2010 to join the Bundesliga and Schalke 04, but his heart still belongs to the Madridismo and the club where he spent 16 years of his professional football career. In a short interview to a French magazine earlier this week, Raúl addressed one of the hottest topics of the moment: Cristiano Ronaldo's future. Raúl: "Cristiano Ronaldo is a great football player and an exemplary professional. He shows it week after week and there's just no other way to see it. I've had the honor to play with him for a full season and I can only say I have a great admiration for him. His present is at Real Madrid and I honestly hope that so does his future. However, that's his decision and I really don't know what is going to happen in the next months...", commented the former Real Madrid striker, who made his debut for the Merengues back in 1994, becoming the club's youngest player ever to play for the first team at the time, when he had only 17 years and 124 days. 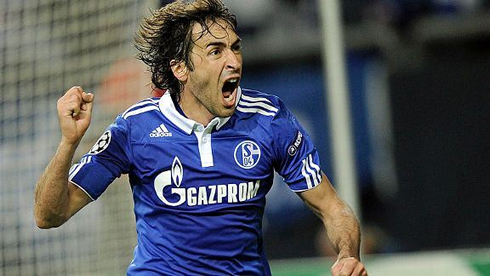 As a Real Madrid player, Raúl has set a really high standard for what the fans could expect from a forward. During his 16-years at the club, he won nothing less than 6 La Ligas, 4 Spanish Super Cups, 3 UEFA Champions League, 1 UEFA Super Cup and 2 International Cups. An enviable resume from a player who still holds the record for both the most appearances ever in Real Madrid (741 games), as well as the all-time top-goalscorer in the club, with 323 goals. Cristiano Ronaldo comes a bit behind on 6th place and with 199 goals out of 196 games so far, but is second to none when we look at his goalscoring ratio [1.02]. Whether or not Cristiano Ronaldo will leave Real Madrid this summer, there seems to a growing speculation surrounding his future as the football season gets near to its end. Unsurprisingly, his name keeps being linked with the likes of Manchester United, Chelsea and PSG, just to state a few. A return to Old Trafford is by far the most likely scenario, but only in the case that Ronaldo really decides to leave Real Madrid and go for the quest of more titles abroad. Cristiano Ronaldo next game for Real Madrid will be against Malaga for the Spanish League, on May 8, 2013. You can watch Juventus live stream, Real Madrid vs Malaga, Atletico Madrid vs Barcelona, Manchester City vs WBA and Sunderland vs Stoke, all matches provided from our football stream section.